Alderney is a small island, with a small population, so I must make it clear that although many of my characters are based on real people, their words and actions are creations of my twisted mind. I owe an especial debt of gratitude to Robin Whicker, who has not only given me valuable suggestions, but has allowed me to use his name and some of his characteristics. I must therefore stress all the more strongly that the character who bears his name is nonetheless entirely fictional; the real Robin would never have done or said any of the unpleasant things I have attributed to my character. And I would be remiss if I did not also offer special thanks to Ann Marie Dickinson, who has patiently answered my endless questions, and to Constable Rick Flatres, who has kept me honest about police procedures in Alderney. To Suzi and Barbara and the many other people who were so kind to me when I visited Alderney: heartfelt thanks. I have invented hostelries and shops and eateries, but have also made use of real ones. I say again that this is a work of fiction, and all institutions and places of business are used fictionally, their real procedures adapted to suit my needs. (The real jumble sale, for example, is not run at all the way I have portrayed it.) Alderney residents must not be dismayed if I have moved buildings, or changed schedules, or run up streets where none exist. That is a novelist's privilege. Those who know the island well will, I hope, find my rendition loving and faithful. 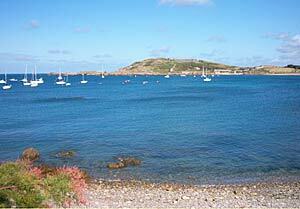 Those who do not will perhaps find in the book many reasons to spend some time in Alderney. It is a delightful place, and every bit as welcoming as I have tried to paint it.